Projects range from low-level programming libraries like GDAL/OGR (that is also used by ESRI software) to full-fledged desktop apps like QGIS and gvSIG and powerful web-mapping frameworks (GeoServer and MapServer). But there’s much more, really. Take a look for yourself on the OSGeo wiki. OSGeo Projects are freestanding entities, handled by their own Project Steering Committees. so I have been wondering how much interaction there is among OSGeo projects, looking at people who are members of Project Steering Committees (PSC). PSCs are the governing body of each project, and they vary a lot in membership size, structure and activity, but ultimately their purpose is the make sure that nothing happens in isolation and that decisions are consensus-driven in democratic way, as required by the OSGeo rules. 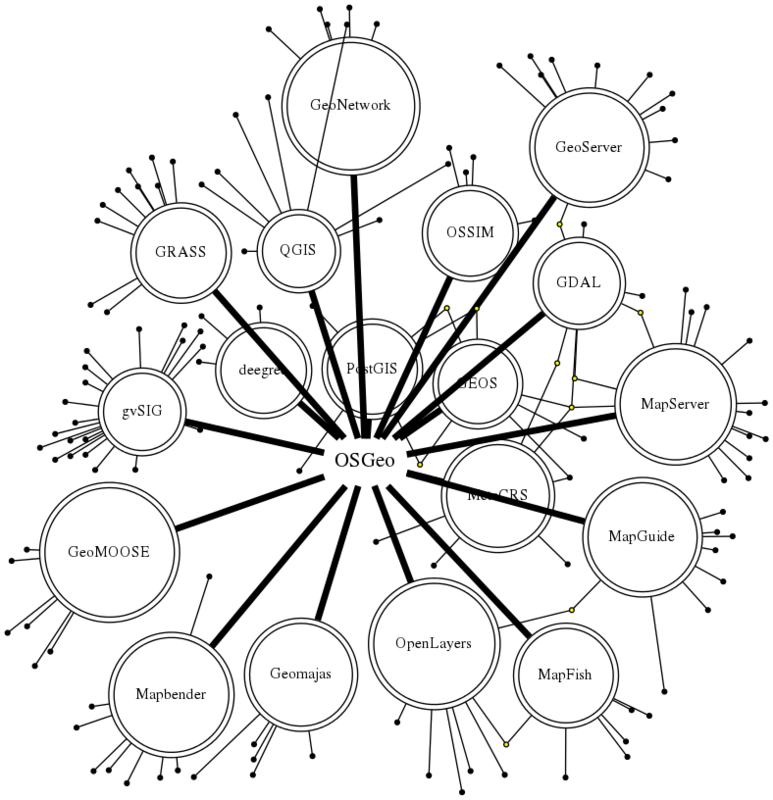 My initial idea was simple: look at PSC membership as a graph, with members and projects as nodes, all converging into OSGeo. That makes for a nice umbrella-shaped graph! Small black dots represent PSC members. You will notice that several members are part of more than one project. That’s the OSGeo cabal! Almost like a Swedish conspiracy! 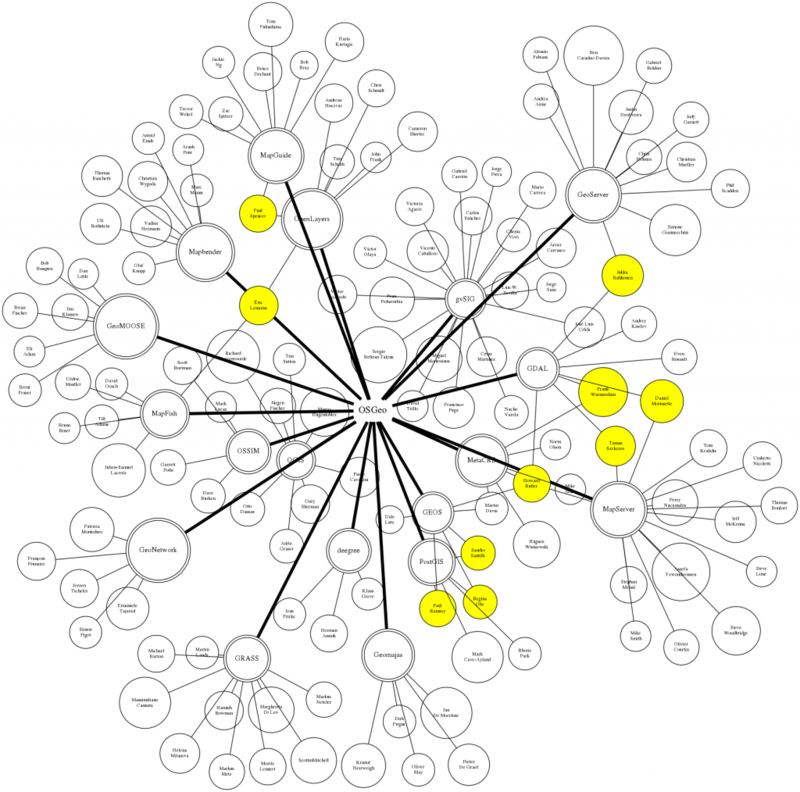 In yellow: the cabal, revealed! Click for the larger version. Jokes aside, there is of course some connectedness, namely in two clusters: the webmapping cluster and the “founders” cluster: GDAL, UMN MapServer, PROJ.4 (part of MetaCRS), GEOS and PostGIS are all OSGeo founding projects and are in many cases the core components of the OSGeo software stack. The source file is found in this gist and is free to use if you want to develop new visualizations. Of course this is by no means informative of the actual interaction of the larger OSGeo community (that is orthogonal to projects), and even within projects there is much more to look at: mailing lists, code repositories, issue trackers, etc. The nice thing here is that to obtain the data I needed I took the opportunity to review the available information and even fixed a few things in the wiki page linked above. Take it as a first step in developing a wider understanding of the “hidden structure” in the OSGeo community.